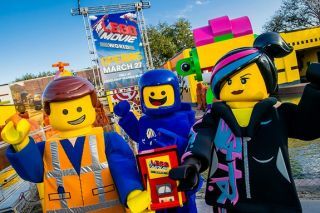 THE LEGO MOVIE Masters of Flight takes guests on a suspended ride aboard Emmet's Triple Decker Couch surrounded by a full-dome virtual screen, giving the sensational feeling of flying through a world created completely from LEGO® bricks. The attraction is the first in the world at a major theme park that embeds a 180-degree turn in the ride experience. The ride animation will feature a humorous and magical adventure as guests soar through Cloud Cuckoo Land, dive to Middle Zealand and splash down on the waters of Pirate's Cove.